Offering decadent wine-tasting tours through the Bordeaux region of southern France, the AmaDolce is perfect for a river cruise rich in culture, comforts and cuisine. Experience the sweet life onboard the AmaDolce. Offering decadent wine-tasting tours through the Bordeaux region of southern France, the AmaDolce is perfect for a river cruise rich in culture, comforts and cuisine. Taste the decadent reds that made the region famous, as well as a lesser-known sweet white wine called Sauternes. Tour a vineyard and see how your favorite vintage is made. And visit the fairy-tale castles of the Loire Valley and hear the histories of their epic inhabitants, from Catherine de'Medici to Leonoardo da Vinci. A journey on the AmaDolce is a journey through time. A thoroughly modern river boat, the AmaDolce fuses the best in river cruise traditions with innovative new features. River cruise veterans will not miss the sun deck, the Main Lounge or the evening lectures preparing passengers for the next port of call. But unique to the AmaDolce is a top-deck whirlpool, an expansive massage and hair salon, and rentable bicycles and Nordic walking sticks, which active cruise passengers can take along on shore excursions. 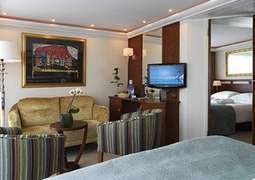 The staterooms on the AmaDolce are furnished in relaxing caramel and earth tones. Every room has a river view, and most also include a French balcony. Luxurious bedding guarantees a restful night's sleep, and added comforts such as free bottled water and high-speed Wi-Fi will provide you with all the conveniences of home. An interactive television which doubles as a computer will keep you well-connected, even on longer journeys. Upgrade to a suite to experience additional luxuries such as a spacious sitting area, a king-size bed, and a bathtub. 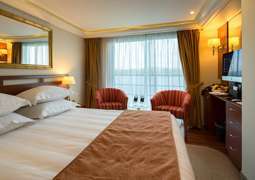 Single rooms are also available for solo travelers at no extra charge. The main dining room on the AmaDolce serves a variety of European and continental fare, often inspired by the destination areas of the cruise. Expect a hearty breakfast with a smorgasbord of cold cuts, cheeses and breads, as well as warm dishes like eggs, oatmeal and bacon. Build your own British breakfast with hash browns, baked beans and fried tomato. Wine and beer are included in the cost of the cruise, and both flow freely during lunch and dinner. A must-see on the AmaDolce is the Chef's Table, an interactive culinary experience where passengers can watch master chefs prepare gourmet dishes in an open kitchen, and of course taste the fruits of their labor at the end. The Chef's Table experience does not cost extra to attend, though passengers are advised to reserve a place well in advance as spots fill up fast. The AmaDolce offers destination-intensive cruising, with onboard activities revolving around preparing for – or recovering from – a long day at port. With long stays in each harbor, there is ample time to take part in multiple shore excursions, as well as explore the city on your own. Nightly lectures and daily newsletters teach passengers about upcoming destinations, and evenings are generally low-key. The Main Lounge is the main public space for entertainment, and a pianist provides live music throughout the day. A small salon offers massages and haircuts at reasonable prices. The AmaDolce features a casual daytime dresscode, with passengers wearing comfortable shoes and active wear to prepare for the day's excursions. On most evenings, passengers dress country club or smart casual, with khaki pants and flowing skirts making frequent appearances. The only formal event, the Captain's Dinner, occurs once per cruise, and here passengers typically wear dress pants and nice shirts, with the occasional dress or suit.